Let’s take a stroll down memory lane, shall we? Here’s how much respect our soon-to-be-former President has for us. Remember how quickly he became comfortable in the Oval Office? Remember how politely he treated his opponents? Remember how dignified he required his staff to be? Friends, the most inportant election of our lifetimes is less than a week away. Vote for class over crass. I defy you to watch this entire interview and not tear up at the very least. In exactly one week, we all have the opportunity to vote out of office the band of thugs, liars, and crooks who caused this outrage. Make sure you’re doing all you can to ensure that happens! All other things aside, which man would you rather see in the Oval Office? He may not be Reagan, but if we can get Romney into office, we may just see Pre-Dawn in America. Twelve more days, folks. You know what to do. Reuters, AP, the Daily Caller, heck everyone is reporting this morning that both the State Department and the White House were informed within two hours of the attack on the Benghazi consulate that Ansar al-Sharia, a militant Islamic group in Libya, had claimed responsibility for the invasion of the compound and the assassination of four Americans there, including our Ambassador. If I was angry before, I am beyond outraged right now. The President of the United States watched in real time as our consulate was being attacked. He watched and did nothing. He could have sent jets, he could have called in the Marines… They may have arrived too late, but it would have been something. He knew, but He. Did. Nothing. And he had no response to the American people at that time. In fact, apparently watching our consulate burn was so exhausting, he went to bed — either just before or just after being informed that it was a terrorist attack by a known Islamic group. And this act of war weighed so heavily on his mind that, the very next day, President Obama flew from Washington DC to Las Vegas for a fundraiser. In other words: He knew but He. Did. Nothing. And then our president has the gall, the temerity, the audacity to send his minions arount to lie to the press, to lie to the American people, knowing what he knew within two hours of the attack. I am so far beyond outraged right now that words are failing me. The only ones that keep coming out are very bad, non-family-friendly words that I won’t include in this blog. President Nixon resigned from office. President Clinton was impeached. Neither of the scandals which imbroiled them had an actual body count. This man, this selfish, callous, cowardly man we chose as President, must not be re-elected. He has only contempt for the nation we entrusted to him. If he were a man, he’d already have resigned. But he’s not a man, he’s a cowardly, skulking, self-centered, me-first-me-only America-hating, liberal socialist narcissist, so we’re going to have to vote him out. Two weeks, folks. Two short weeks. Let’s roll. I’ve been noticing things lately around here. Things like a prepoderance of Scott Brown yard signs (running about three to one in favor of our favorite RINO). And more springing up every day; just last weekend a huge new sign went up in the empty lot right across from the grocery store. Huge. Highway billboard big. SCOTT BROWN. Hard to miss. Also, in noticing the yard signs, I also noticed that with the Scott Brown signs there are also likely to be Romney/Ryan yard signs as well. In those yards that sport Warren signs, there are no Obama/Biden signs. None. 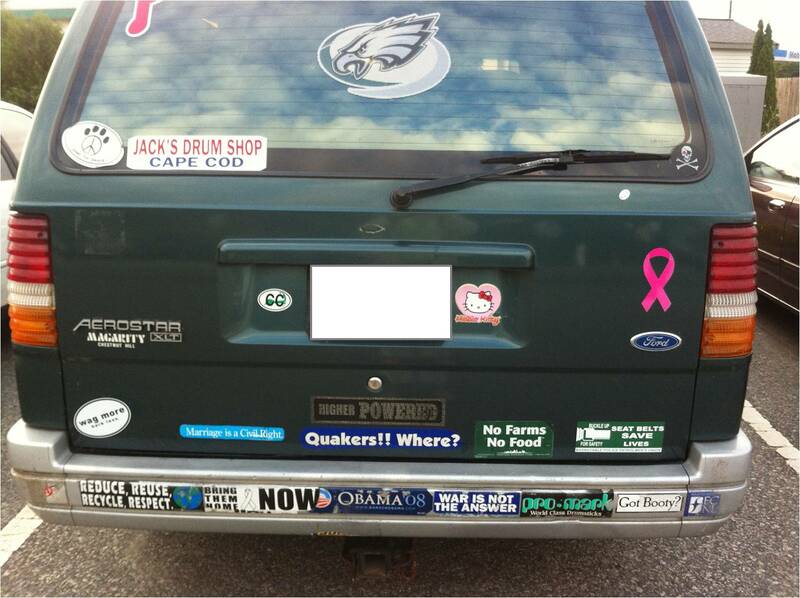 Right; not only is there no Liz Warren sticker, there’s no Obama/Biden 2012 sticker. While I’m not saying that Massachusetts is turning red, I do think it’s telling that this time around, those who couldn’t wait to embrace the hope and the change in 2008 aren’t even bothering to voice their support in the most socially ubiquitious way this time around. And that’s enough for me, here in Massachusetts. “Freedom of the press is a flaming sword. Friends, the time you spend watching this video is perhaps the most important 26 minutes you’ll spend before the election. After you watch it, if you agree, please be sure to share it with as many people as possible. This is only part of what we’re fighting against. And we must prevail. You are currently browsing the Grand Rants blog archives for October, 2012.